HA NOI (VNS) — The country's total retail sales and services revenue reached US$110 billion, rising 9.8 per cent over the same period last year, or 9.1 per cent, if inflation is excluded. According to the General Statistics Office (GSO), the retail sales of goods and services in September alone is estimated to reach VND270.6 trillion ($12.27 billion) or 0.6 per cent increased against August. 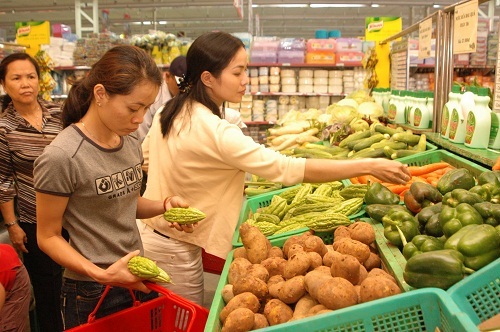 According to an expert at the GSO, Vu Manh Ha, purchasing power had not changed much as residents spent their money on key consumption products. Revenues in some sectors saw a handsome increase. Food and foodstuff saw an increase of 15 per cent, household appliances rose 13.2 per cent, garments and textiles up 10.9 per cent and transport services are estimated to increase 8.1 per cent. Retail sales of accommodation, restaurant and catering services in the first nine months reached VND276.9 billion posting a growth of 11.7 per cent or a 6.5 per cent year-on-year increase. Of this figure, retail sales in Hai Phong City went up 23.9 per cent. It was followed by Binh Duong at 19.1 per cent, Thanh Hoa at 18.6 per cent, Ha Noi at 5.9 per cent, and HCM City at 5.4 per cent. In the first nine months, the increase in purchasing power equalled H1 and H2 this year. It was attributed to more purchases of essential goods by residents during the country's National Day on September 2, and the Autumn Festival on September 27. Purchasing power was one of the indicators which reflected the macro-economic recoveries in the first nine month of this year.